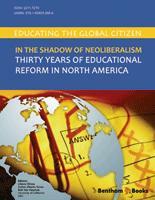 "In the Shadow of Neoliberalism: Thirty Years of Educational Reform in North America"
Educating the Global Citizen provides a comprehensive overview as well as fine-grained analyses of the impact of globalization on the three countries (the United States, Canada, and Mexico) of North America. The international scholars assembled in this volume document how the various forces of globalization interact not only with national but with state/provincial and local levels of society to shape the goals, governance, financing, content, processes and outcomes of education. Of particular concern to the contributing authors is this driving question: What implications do educational reforms of the past three decades have for the formation of democratic citizens and the achievement of more just societies? Moreover, who benefits from current public policies framed by a dominant neoliberal ideological agenda that promotes privatization and decentralization of social services as well as a market logic and competitive business model determining the regulation and running of school systems? In systematically critiquing the deleterious consequences of these current policies, the authors also point out the contradictions that beset them and engender opposition. They describe democratic movements that both resist and offer alternative views of how education systems can contribute to individual development and collective well-being. Educating the Global Citizen is the first volume in a series of comparative case studies undertaken in sixteen countries. The book’s useful conceptual framework and cogent organizing themes are an excellent introduction to a cumulative body of scholarship that promises to illuminate the most significant issues confronting education systems internationally. Globalization has emerged as one of the most important phenomena of the twenty-first century, challenging national borders, long established institutions of governance and cultural norms and beliefs. Global media culture, neoliberal economic policy, transnational migration, anti-globalization movements and the war on terror all influence people and nation-states in a multitude of positive and negative ways. While the process has been underway for centuries, it is clear that it has accelerated and broadened its reach in the past few decades. Today it remains one of the most debated topics inside and outside academia. Neoliberals and free market advocates argue that it is a natural process that liberates markets, improves economies, spreads democracy and improves the quality of life. Opponents see it as overwhelming the cultures, economies and people of the global South, pointing out that poverty and income inequality have actually increased substantially since the 70s. Many others wade in the nebulous space between the two camps recognizing the dialectic nature of this complex phenomenon. Consensus does appear to exist that globalization profoundly influences the social, political and economic spheres around the world and that efforts to stop the process are largely futile. Extensive research has been undertaken across the disciplines to explore globalization’s effects. Within education, innumerable books and papers have analyzed the effects of globalization on educational policy and practice (Bush, 2007; Stieglitz, 2002; Suarez-Orozco & Qin-Hilliard, 2004; Burbules & Torres, 2000; Torres, 2009a). Among the questions researchers ask include: why globalization has moved to the forefront of social, political and economic life; what different constituencies mean by globalization; how it varies from one context to the next; and how it impacts decisions on governance, administration and policy within educational systems and schools? With this book, we attempt to step into the fray by exploring its effects on educational policy over the past three decades, asking specifically how globalization has influenced policy in North America. Before we can move forward to answer these questions and investigate the magnitude of its influence inside and outside schools, we must first define globalization. Globalization clearly means different things to different people. Held (1991) defined it as “the intensification of worldwide social relations which link distant localities in such a way that local happenings are shaped by events occurring many miles away” (p. 9). Urry (1998) expands on this idea to argue it is the transformation of time and space where complex interactions and exchanges that were once practically impossible become commonplace. Luke and Luke (2000) focus on the economic element describing it as “a feature of late capitalism, or the condition of postmodernity … [leading to] the emergence of a world system driven in large part by a global capitalist economy” (p. 287). And Castells (1997) and Touraine (1998) see it as an assault on traditional notions of society and the nation, where the very nature of citizenship is dramatically altered. We believe all of these definitions provide valuable insights into contemplating its reach and importance. It is important to note however that globalization varies from one country and context to the next, with some more heavily influenced by outside forces and others just beginning to experience global power at the local, state and national levels. Its influence, for example, varies between the Global North and South with the former in many cases benefiting from its push toward market liberation while the South tends to suffer under its influence, even as it provides opportunities for export driven economic growth (as in China and India). Globalization is also multifaceted, and as Torres has previously argued, comprises four related forms including the popularly conceived neoliberal version, one ostensibly working to spread human rights and democracy, a third tied to terrorism and the war on terror and finally the loose confederation of organizations and individuals grouped under the label of "anti-globalization." The first form of globalization, often described as globalization from above, is framed by the pervasive neoliberal ideology. Neoliberals call for the liberation of national markets to increase commodity and capital exchange, the loosening of borders through regional trade and economic cooperation agreements (like the EU and NAFTA), the elevation of free markets over public goods and state intervention, the proliferation of fast-paced economic and financial transactions, and the establishment of transnational governing systems that supersede the nation-state. The movement is based on an almost blind faith that markets are superior to governments and that the root to economic prosperity and democratic freedom is market liberation and privatization of public goods. A second form of globalization represents the antithesis of the first, often described as globalization from below or anti-globalization. One could argue that this is a misnomer, though, as the various groups and movements aimed at challenging neoliberal versions of globalization are not opposed to increased international integration in general, but to specific elements of the process that tend to cause increased inequality, loss of national autonomy, challenges to local culture, values and beliefs, corporate interests trumping the common good and a general worsening of conditions for the average global citizen. Globalization from below is largely manifest in individuals, institutions, and social movements actively opposed to what they perceived as corporate-driven globalism, led by the motto “no globalization without representation.” The 1999 Anti-WTO protests in Seattle and all those since, the World Social Forum and World Economic Forum are some of the bigger and most well-known examples of this loose confederation of organizations and individuals. Emanating in part from the 1948 United Nation’s Universal Declaration of Human Rights, a third form of globalization pertains to spreading human rights across the globe. This movement is led by the international system and international law, as well as a series of NGOs and non-profit organizations, who are questioning, challenging, forbidding or outlawing many traditional religious and cultural practices deeply sewn into the fabric of particular societies, including in Iraq and Afghanistan. Advancement of cosmopolitan democracies and plural citizenship is at the heart of this strand of globalization, leading to both positive and negative results that are often difficult to disentangle. Hardt and Negri (2000), for example, argue that human rights organizations and NGOs often indirectly (and one would assume unconsciously) often end up legitimating the use of force based on human rights violations, as in both Iraq Wars. One could further argue that they tend to indirectly support the push of neoliberals, who often tie market liberation and capitalism to democracy, as if the two predetermine each other. A final form of globalization is the ongoing international war on terror. This new form of globalization has been prompted in large part by the events of September 11 – interpreted by many as the globalization of the terrorist threat – and the subsequent reaction of the United States. The anti-terrorist response has been militaristic in nature, resulting in two coalition wars led by the U.S. against Muslim regimes in Afghanistan and Iraq. Yet, the overall theme of this process transcends its military aspect to emphasize security and control of borders, people, capital, and commodities; in some cases reversing the opening of markets and high-paced commodity exchanges while simultaneously again serving as the foundation for arguments on democracy and market liberation as the only legitimate way to counteract the breeding of terrorism and dangerous rogue states ruled by dictators like Saddam Hussein. This form of globalization is premised on security as a precondition of freedom, while terrorism obviously endorses the converse idea that only violence and chaos can bring radical change. Bringing the four schema of globalization together is the proliferation of new technology and media that help connect ideas, culture, knowledge, peoples, groups and organizations across the globe. The Internet and a global media culture help expand access to knowledge and ideas that both expand, complexify and challenge local culture and governance structures. New media and technology thus create a virtual world unencumbered by the borders that separate us, increasing cultural exchange and border crossing while often facilitating the expansion and consolidation of neoliberal globalization in countless ways. It is possible that transnationalism’s primary action is to collect the cultural (language, identity), emotional (feelings and aspirations) and territorial (spaces, land) elements that have nourished nationalism in order to resignify them, reshape them and create new mechanisms: sometimes it is emancipatory and sometimes repressive (p. 5). Transnationalism is thus an aspect of globalization focused on culture, production and interconnectivity. Internationalism, on the other hand, looks at the relations between and among nation-states. It is a political movement advocating greater economic and political cooperation, including groups like the United Nations, World Bank, IMF and World Trade Organization and international treaties and custom and trade regulations like NAFTA, AFTA and the European Union. The relationship between transnationalism, a largely cosmopolitan movement, and internationalism, based on cooperation among nation-states, is that they are both strongly implicated in globalization and both have profound influences on education. Transnationalism largely describes the cultural and economic impacts of increased cultural exchange, migration and global production while internationalism provides insights into many of the organizations influencing educational policy in the Global South. The third term, mondialisation, focuses on the solidarity of populations, building on universal human rights and international structures of governance while respecting cultural diversity. Scholars like Benhabib, Butler, Laclau and Mouffe and Hardt and Negri have explored globalization through this lens, contemplating how democracy can transcend national boundaries by moving beyond universal rights and freedom to implicitly consider questions of diversity and difference alongside the democratic principles of liberty and equality (Benhabib, 2004, 2006; Butler & Mouffe, 1997; Hardt & Negri, 2004; Laclau & Mouffe, 2001). Benhabib in particular argues for the need to explore and negotiate the conflicts of difference that she believes are a permanent feature in diverse societies and ensure that individual groups are free from political and communal limits on their freedom to association and engage in politics. Hardt and Negri (2004) however find great hope in the diverse groups they believe form a loose confederation (or multitude) than will ultimately challenge and overturn the emergent empire of multinational corporations and American militarism. These scholars are challenging us to redefine democracy in more pluralistic terms right at the moment the problems of globalization and diversity proliferate in democratic societies across the globe. What is clear is that globalization is altering the face of communities and nations and the lives of individuals who increasingly cross borders both constructed and real. It is also affecting the constitution of the nation-state, its borders and by implication citizenship and we suspect that it is deeply transforming the life of schools and teachers as well. The question then becomes how these multiple forms and manifestations of globalization relate to education. In this book we argue this occurs in multiple ways, but will focus here on three: neoliberal educational policy, diasporic citizenship and its curricular challenges and through the effects of technology and cultural sharing on youth and schools. One of the dominant faces of globalization today is neoliberal globalization, which “promote[s] notions of open markets, free trade, the reduction of the public sector, the decrease of state intervention in the economy and the deregulation of markets” (Torres, 2009b). We argue throughout the book that neoliberalism has been the dominant force in educational policy reform in the Americas since the 80s and that it should thus be a key focus of research on globalization. The critique of neoliberalism offered in this book focuses, first and foremost, on the implications of the neoliberal discourse on the construction of a new common sense in educational environments during the past 30 years of educational reform initiatives in North America (Canada, the United States and Mexico). In this debate, technocratic strategies promoted by liberal and conservative governments have dominated, representing a global agenda for research, teaching, evaluation and educational reform founded predominantly on a market ethos backed by highly proscribed notions of education, knowledge and the role of schooling (Apple, 2001). Essentially, in the past three decades we have witnessed multinational and international actors like the World Bank, IMF, UNESCO and the OECD playing a major role in redefining the purposes, aims and goals of education across much of the globe, aligning reform with the major tenets of neoliberal economic policy (Klees, 2008; Vinokur, 2008). Certainly, it can be argued “what is really ’neo’ in the neoliberal doctrine is its hegemonic pedagogical project. Liberal economist models fail because they postulate rational economic agents and ‘natural’ laws of the markets. Neoliberals assume that, the agents being irrational and the law of the market anything but natural, the main function of the state is to construct the markets and coerce the agents into the requested rational behavior – individualistic, competitive, maximizing, free/condemned to choose on the basis of a cost-benefit calculus” (Vinokur, 2008, p. 364). Neoliberalism in education is thus arguably closely tied to neoliberalism’s overall project, with knowledge production and training assisting in the maintenance and proliferation of a system premised on capitalist accumulation, profit maximization and market ethos spreading to all areas of political, economic and social life. A further goal of neoliberalism, as argued by Paulo Freire, involves selling itself as the best system and inevitable culmination of the historical struggle for human freedom (Freire, 1998). Neoliberalism in this sense perpetuates itself by claiming an immutable present with no viable alternatives available. Giroux, in fact, argues neoliberalism “thrives on a culture of cynicism, insecurity and despair. Conscripts in a relentless campaign for personal responsibility, Americans are now convinced that they have little to hope for – and gain from – the government, nonprofit public spheres, democratic associations, public and higher education” (2004, p. 105). The current financial crisis has certainly challenged this logic, but within the realm of education there has been little contemplation of the shortcomings of the model and alternatives that could better address current domestic and global challenges, at least among policymakers. Obama and his secretary of education Duncan, in fact, appear to embrace many elements of this consensus including largely supporting NCLB, merit-based pay and charter schools – essential components of what Diane Ravitch has labeled the “accountability and choice” movement that appears closely aligned with neoliberal ideology (Ravitch, 2010). A more detailed description, analysis and criticism of neoliberalism are provided throughout the remained of the text, but one observation is in order. As Michael Apple has stated in several of his own works, neoliberalism and neoconservativism are often two sides of the same coin (Apple, 2001). While neoliberalism emphasizes the economic characteristics of a model of global capitalist hegemony, neoconservatism offers, as an addendum that is not contradictory to the above stated principles, a set of moral and ethical codes, which dovetail quite nicely with the principles of neoliberalism. We believe a second key component of the discussion on globalization is the notion of “diasporic citizenship,” brought about by the increased movement of peoples across national borders. There is no question that, in the United States, and a host of other countries including Canada, Argentina, Mexico and those in the European Union, the presence of documented and undocumented migrant students serves as a catalyst for some of the most pressing pedagogical and political challenges confronting schools systems, compounding the 19th century social transformation based on systematic socialization to create citizenship and nationalism in various countries around the world. One of the characteristics of diasporic citizenship is the creation of transnational communities and cultures and dual (or multiple) identities and citizenships, which relate in complex ways to the rise of "identity politics" at the local level. Yet, we need to include in this debate the notion of transnational families which have a real impact in the lives of communities and nations. The educational challenge becomes one of determining what bicultural models are implicated in these changes and what pedagogical and curricular strategies best meet the changing demographic nature of national cultures across the globe. Is acculturation used to fully subsume divergent cultures into the mainstream? Is assimilation superior, with the diasporic citizen choosing to adapt to the home culture with little attempt to maintain their original cultural identity? Do schools offer the opportunity for alternation strategies, where both cultures are maintained in the classroom setting – as for example with Mexican populations who could move beyond the dichotomy of speaking Spanish at home and English in school? Or is a multicultural model embraced, where a concerted attempt is undertaken to retain the native culture while providing tools to effectively navigate the mainstream culture? This leads to a third related impact of globalization on education, namely the effects of spreading technology and cultural knowledge across borders. One clear implication of the transnational migration discussed above is the question of language policy and how countries like the United States deal with an increasingly large population of English Language Learners. Do they consider their native tongues as an asset or a deficit to the learning process? And how do political concerns influence literacy practices within schools, as for example in the “English only” movements that have gained momentum in recent years? A second issue is that of how this interacts with technological advances and redefines what literacy means, relating to the work of the New London Group, who argue for the centrality of new forms of literacy, and others exploring cultural and multiple literacy (Barton et al, 2000; Cope & Kalantzis, 2000, New London Group, 2000). Also important to recognize is the ways that UNESCO and the World Bank, among other organizations, have attempted to import educational policy and practices from the West to developing countries, without acknowledging the impact of cultural differences on the effectiveness of these prescriptive practices or the importance of local knowledge and agency (Phillips & Schweisfurth, 2008; Resnik, 2006; Simkin, 1981). In some cases, the dictates of neoliberalism have informed these policy recommendations and interventions, but in others Eurocentrism and lack of focus on the local cultures may have exacerbated the ineffectiveness of the educational policies. The book opens with a systematic analysis of attempts to restructure the U.S. educational systems, based on placing accountability, efficiency and standards at the forefront of debate and reform. Richard Van Heertum and Carlos Alberto Torres discuss educational reform in the U.S. over the last 25 years and the move toward viewing schools as predominantly serving the training and sorting of future workers, culminating with the passage of No Child Left Behind. In the authors view, one key phenomenon today is the fading of the “American Dream” at the same time education remains the very fount of meritocracy, at least rhetorically. This is coupled with the relatively ubiquitous notion that certain knowledge is itself dangerous to the new world order. Carlos Ovando and Salvatore Galbadons then analyze Arizona language policy as a microcosm of ongoing debates about bilingual education and ELL learners in general, in Chapter 2. They start with the premise that transnational migration is one of the key aspects of globalization that affects education, particularly in the Global North, analyzing the contradictory nature of discourse on globalization among two strands of conservatives. Ultimately, they highlight the important relationship between political concerns and language policy in Arizona and beyond. In Chapter 3, John W. Gasko, Angela Valenzuela and Curtis Brewer turn the focus to the impact of neoliberal policies on citizenship in the border state of Texas. Building on notions of cultural citizenship and subtractive schooling, they coin the phrase “subtractive citizenship” to describe and criticize the effects of the neoliberal project on education and culture in Texas, as a microcosm of Border States across the Southern U.S. and beyond. These three chapters offer a systematic explanation of how school reforms in the United States have been affected by neoliberal and neoconservative policies, with its climatic paroxysm under Bush’s No Child Left Behind Act. In Chapter 4, we turn to the Canadian story, as told by Hans Schuetze, Larry Kuehn, Adam Davidson-Harden; Daniel Schugurensky, Nadya Weber and Jocelyn Berthelot. They attempt to show, following a detailed empirical policy study, how globalization has affected K-12 education in Eastern and Western Canada. The book concludes with Mexican scholar Armando Alcántara Santuario, who analyzes the implications of globalization and neoliberalism to dramatic changes in his country’s educational organization over the past 30 years. The book is the first in a series resulting from a 16-country comparative international research project, exploring the complex and multivariate ways in which globalization has affected education, democracy and citizenship. Rather than looking solely at the macro processes of education as they relate to globalization, we plan to dig deeper into the daily lived experiences of people in schools around the world. Specifically, this series results from research undertaken by a 16-country group at the primary, secondary and post-secondary levels of education, as well as popular and informal educational trends in those countries. The three-year study involved focus groups and interviews with teachers and administrators in the included countries, exploring their perspectives on globalization and education and reforms over the past three decades. This book and the next in the series will reveal the case studies of a subset of these countries, offering a window into how globalization has influenced policy and reform, changing student demographics and behavior, administration, funding, pedagogy and curriculum, testing and accountability and the interaction of schools with the world of business and the community. Later we will turn to the results of the empirical research, which focused on the views of teachers and administrators as both actors and subjects of these processes of social and pedagogical transformation. Overall, we work to explore, understand and theorize the everyday experiences and knowledge of the participants in the educational processes and how globalization affects their practice in the 21st century classroom. We hope this series can contribute to a more critical, dialectic view of globalization and education that can inform intervention and praxis to create more just and equitable educational access and opportunities across the globe that serve the goal of human emancipation. Anzaldúa, G. (2007). Borderlands/La Frontera: The new mestiza (3rd ed). San Francisco, Aunt Lute Books. Apple, M. (2001). Educating the right way: Markets, standards, god and inequality. New York, Routledge Falmer. Benhabib, S. (2004). The rights of others. Cambridge, Cambridge University Press. Benhabib, S. (2006). Another cosmopolitanism. Oxford, Oxford University Press. Burbules, N. & Torres, C.A. (Eds). (2000). Globalization and education: Critical perspectives (Social theory, education and social change). New York, Routledge. Bush, R. (2007). Poverty & neoliberalism: Persistence and reproduction in the global south. Eastbourne, UK, Pluto Press. Butler, J. & Mouffe, C. (1997). The uses of equality. Diacritics, 27(1), 3-12. Castells M. (1997). The information age: Economy, society and culture, Volume 2: The power of identity. Oxford, Blackwell. Freire, P. (1998). Pedagogy of freedom. Lanham, MD, Rowman & LittleField Publishers, Inc.
Giroux, H. (2004). The terror of neoliberalism: Authoritarianism & the eclipse of democracy. London, Paradigm Publishers. Hardt, M. & Negri, A. (2000). Empire. Cambridge, Harvard University Press. Hardt, M. & Negri, A. (2004). Multitude: War and democracy in the age of empire. New York, Penguin Press. Held, D. (1991). Democracy, the nation-state and the global system. Economy and Society, 20(2), 138-172. Klees, S. (2008). A quarter century of neoliberal thinking in education: Misleading analyses and failed policies. Globalization, Societies and Education, 6(4), 311-348. Laclau, E. & Mouffe, C. (2001). Hegemony and socialist strategy: Towards a radical democratic politics. New York, Verso. Luke, A. & Luke, C. (2000). A situated perspective on cultural globalization. In Torres, C.A. & Burbules, N. (Eds. ), Globalization and education: Critical perspectives. New York, Routledge. Phillips, D. & Schweisfurth, M. (2008). Comparative and international education: An introduction to theory, method and practice. London, Continuum. Ravitch, D. (2010). The death and life of the great American school system: How testing and choice are undermining education. New York, Basic Books. Resnik, J. (2006). International organizations, the “education-economic growth” black box, and the development of world education culture. Comparative Education Review, 50(2), 173-195. Ritzer, G. (2007). The McDonalization of society: An investigation into the changing character of contemporary social life (5th ed.). Newbury Park, CA, Pine Forge Press. Rocco, R. & García Selgas, F. (2006). Transnationalism: Issues and perspectives. Madrid, Editorial Complutense. Simkin, K. (1981). Comparative and sociological perspectives on third world development and education. International Review of Education, 27(4), 427-447. Stiglitz, J. (2002). Globalization and its discontents. New York, W. W. Norton & Company. Suarez-Orozco, M. & Qin-Hilliard, D. (Eds). (2004). Globalization: Culture and education in the new millennium. Berkeley, University of California Press. Torres, C.A. (2009b). Education and neoliberal globalization. New York, Routledge. Touraine, A. (1998). Sociology without society. Current Sociology, 46(2), 119-143. Vinokur, A. (2008). Engaging with Steven J. Klees. A quarter century of neoliberal thinking in education: Misleading analyses and failed policies. Globalization, Societies and Education, 6(4), 363-365. For instance, the financial remittances of Mexicans from the United States in 2003 ranked second only to the income from oil revenues in the overall GNP, accounting for $15 billion. Other countries like the Dominican Republic rely on remittances from Dominicans in the United States as the most important source of income in the country. Similar circumstances apply to a variety of countries, in diverse epochs, from the remittances of Portuguese laborers in Europe in the seventies and eighties, to the importance of family remittances in Vietnam today. The examples are many and speak of the “global family” that has emerged. Edificio del IISUE, 2o. Piso.